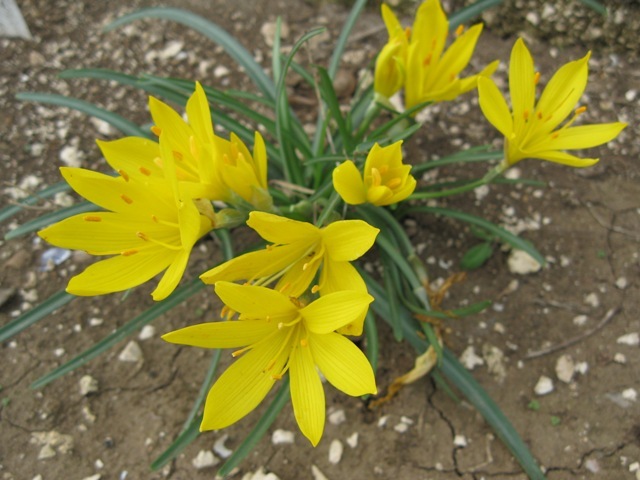 Sternbergia is a genus of the Amaryllidaceae family, found along the Mediterranean basin and the Middle East, often growing in rocky places. 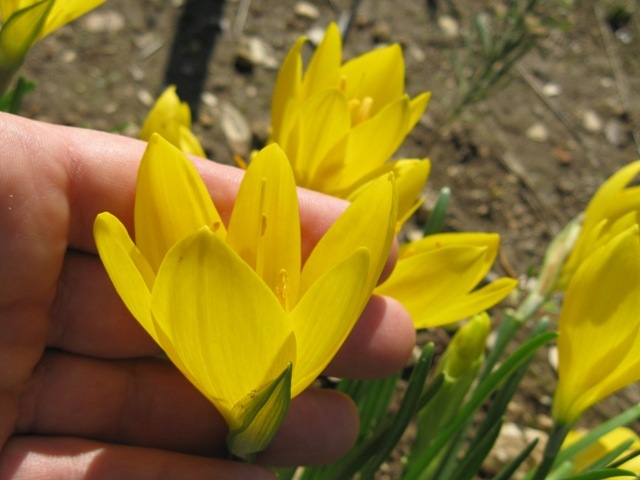 Although they look a bit like Crocus, they are more closely related to Narcissus. 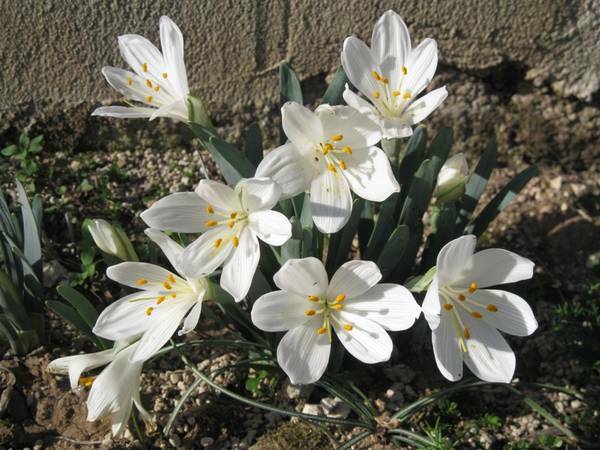 Most of them are yellow and bloom in the fall, but there are a couple of spring flowering species and one that is white. 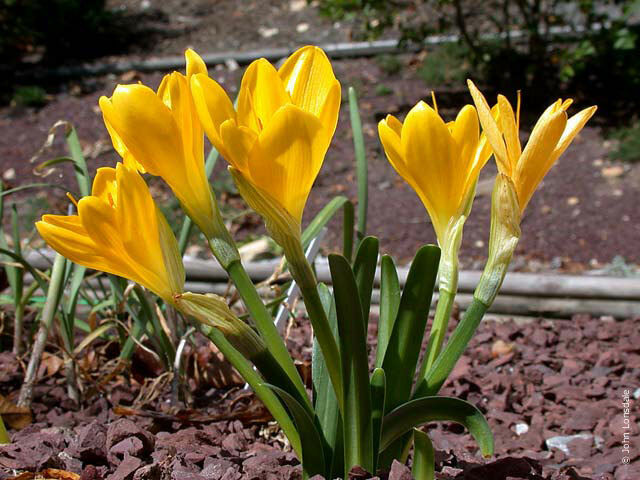 They are winter growing species and summer dormant. 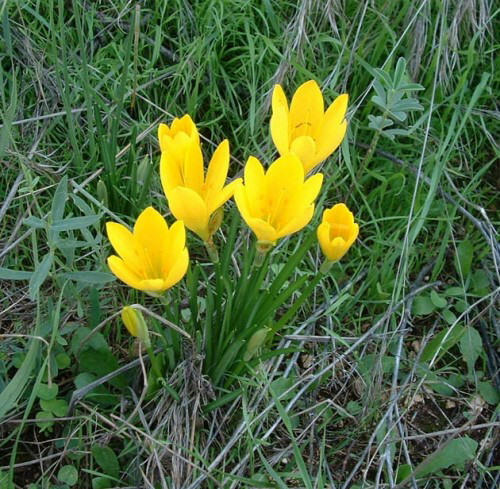 Many of the fall blooming species bloom after the first rains and before their leaves are produced. 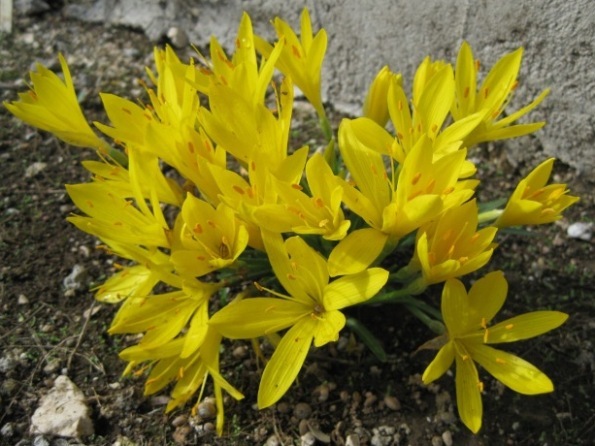 Sternbergia candida B.Mathew & T.Baytop is a rare species of western Turkey, recently described and endangered in the wild, primarily because of collection for the Dutch bulb market along with the more common S. lutea. 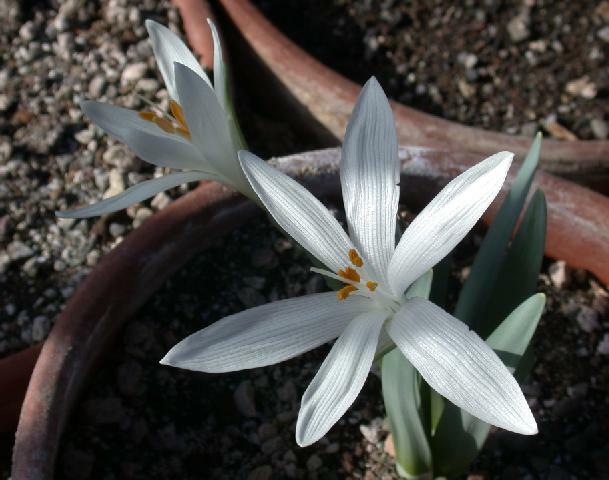 This is the only white-flowered Sternbergia. 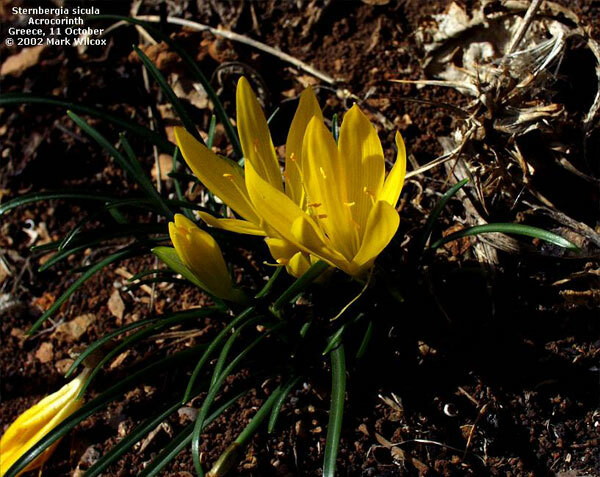 The first two photos below from Jane McGary illustrated a plant that was grown from seed purchased from Jim and Jenny Archibald and took 6 years from sowing to flowering. 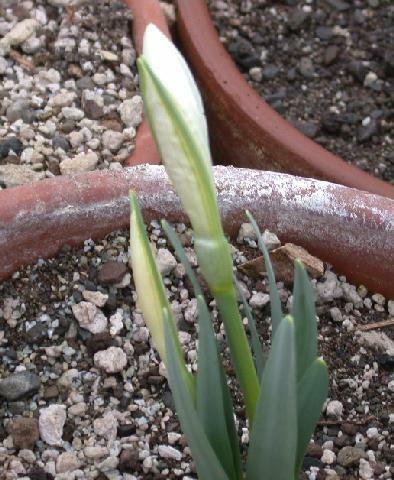 It flowers in late winter to early spring for her (January in a bulb frame in Oregon, USA). The third photo is from John Lonsdale and the final photo is from Angelo Porcelli. 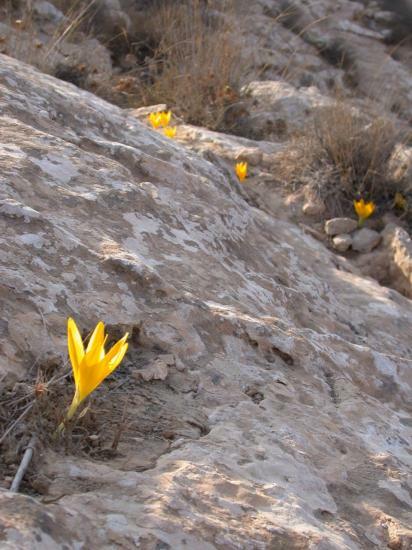 Photos below of Sternbergia clusiana in the wild in Israel by Gideon Pisanty. 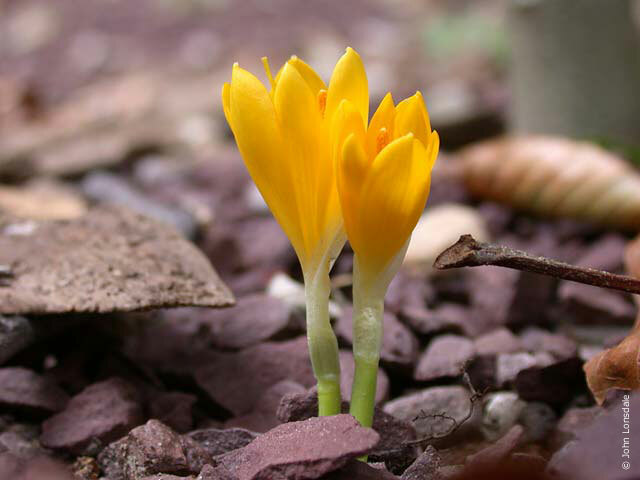 Sternbergia colchiciflora Waldst. & Kit. 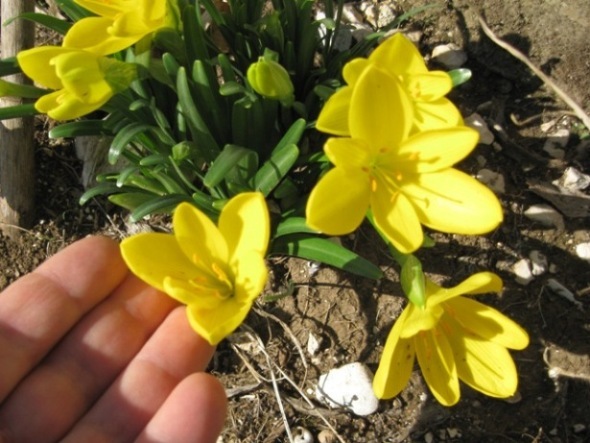 is a diminutive species occurring in Italy, as well as the Balkans and part of Continental Europe, but very difficult to locate for its small stature and fugacious flowering. 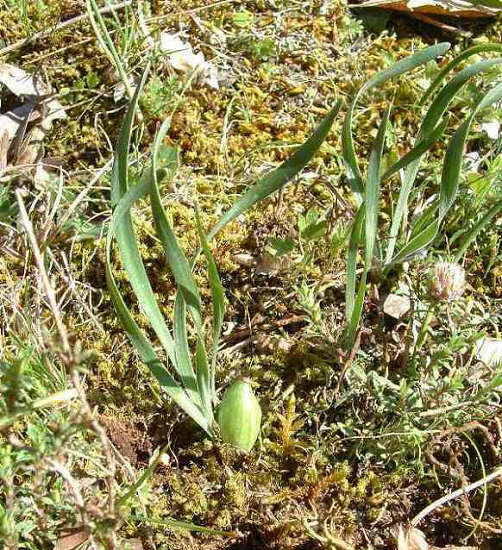 The plant in leaf and fruit resembles a miniature Sternbergia clusiana with its spirally leaves and the fruit at ground level. 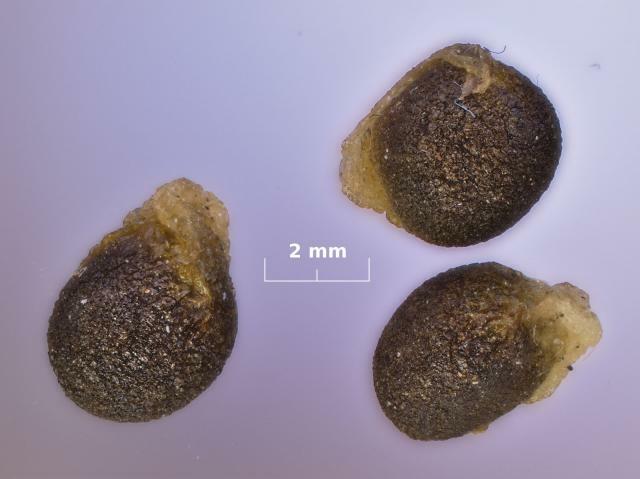 Leaves are finely ciliate indeed. 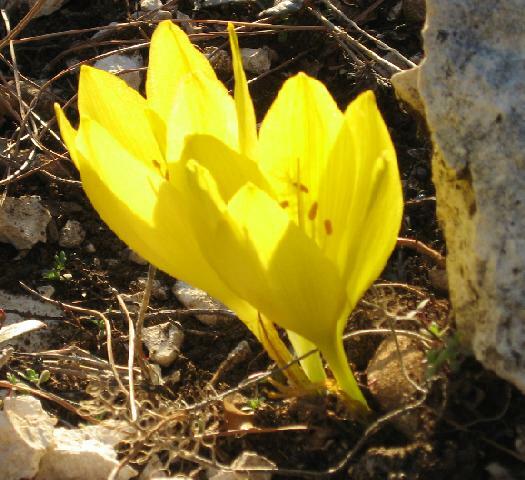 The first photo was taken in habitat on the Gargano woodlands in Apulia by Angelo Porcelli. 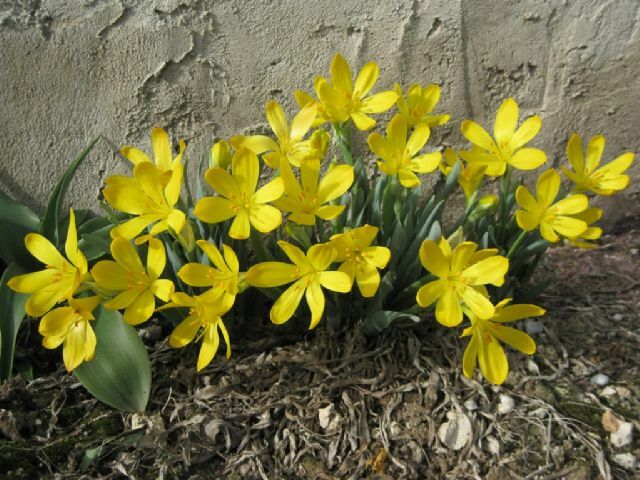 A shy bloomer in warm areas, it needs a cool summer rest. The next two photos were taken by Alessandro Marinello. 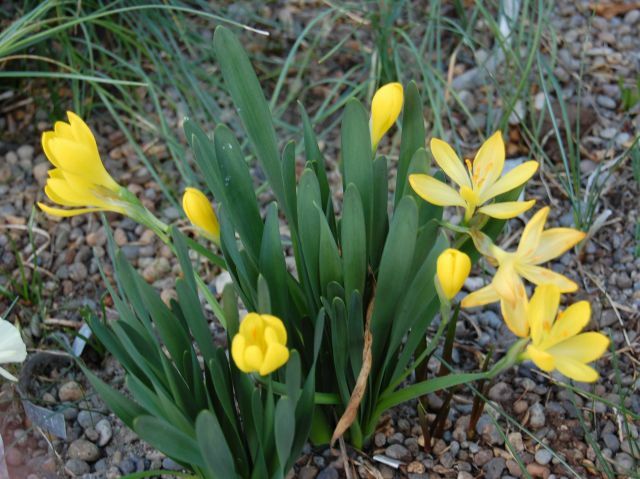 Sternbergia greuteriana Kamari & R. Artelari, although a published name, is considered by Kew to be a synonym for Sternbergia lutea. 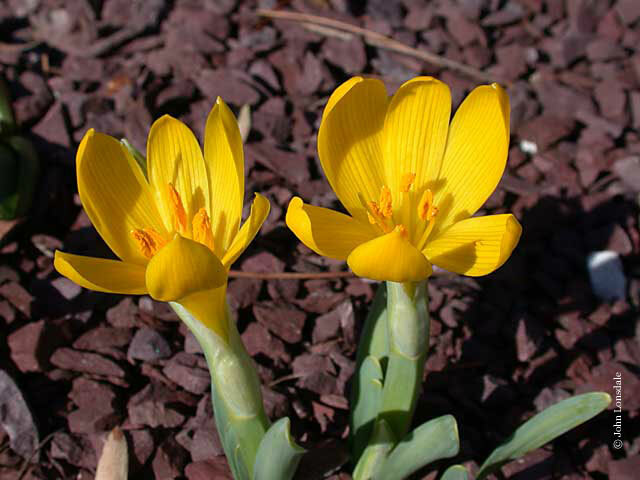 This species or form is smaller and the first photo from Jane McGary of plants grown from purchased seed of garden origin includes a flower of S. lutea for comparison. 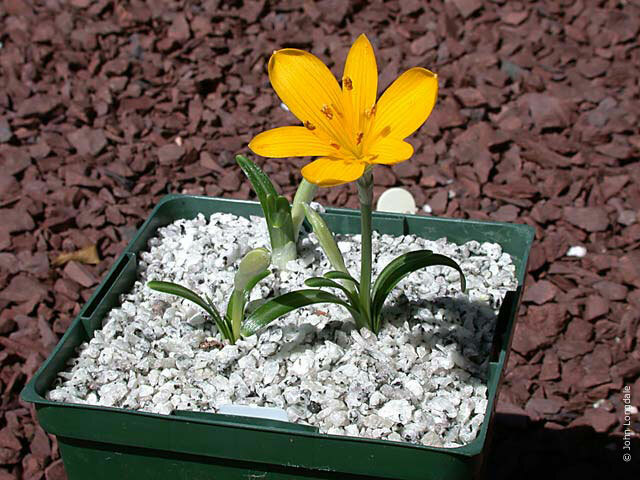 S. greuteriana is easy to grow in an unheated bulb frame, increasing modestly. 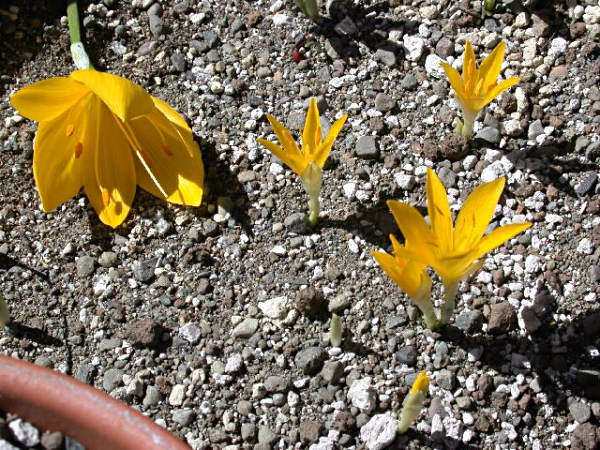 The second photo was taken by John Lonsdale while third and fourth photos were taken by Angelo Porcelli showing the same plant after one year, increasing and flowering profusely. 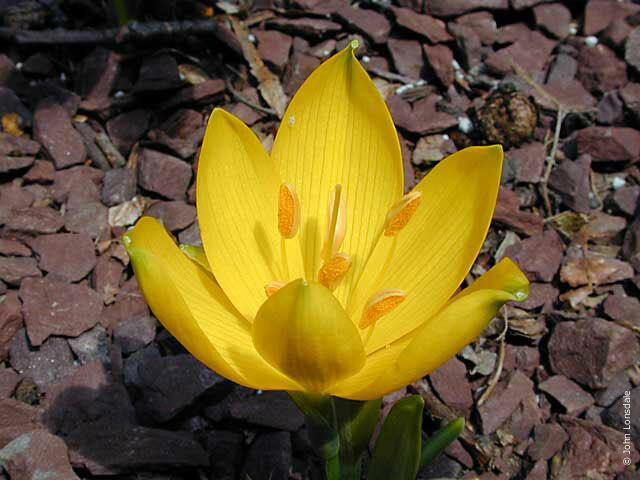 Sternbergia lutea (L.) Ker Gawl. ex Spreng. 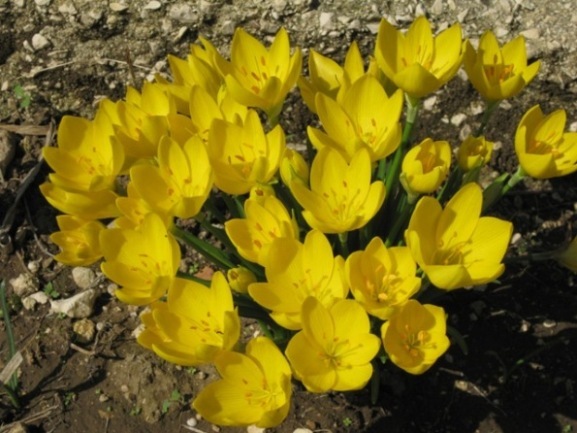 is the most often grown of the fall blooming species, found in Europe and Asia. 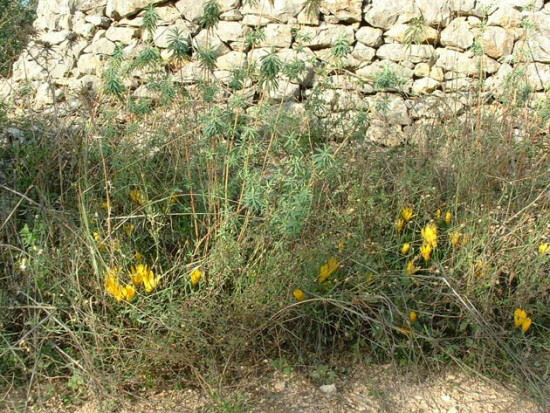 In Italy it occurs usually in stony soils, in open areas. It is still rather common in rural areas, along country roads. The first three photos were taken by Angelo Porcelli. The fourth photo was taken in the Mani Peninsula, southern Greece, in late October, by Jane McGary. 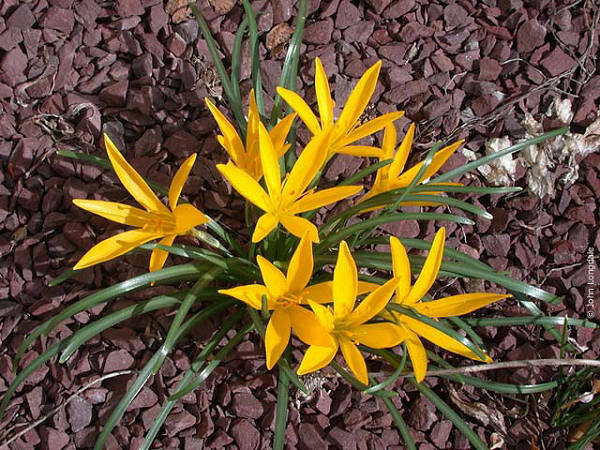 Occasionally, multi-petal forms can occur, as in Zephyranthes. The first photo taken in habitat by Angelo Porcelli in Apulia - Southern Italy illustrates this. The next two by John Lonsdale show the typical forms. These are forms Angelo Porcelli has selected in habitat. 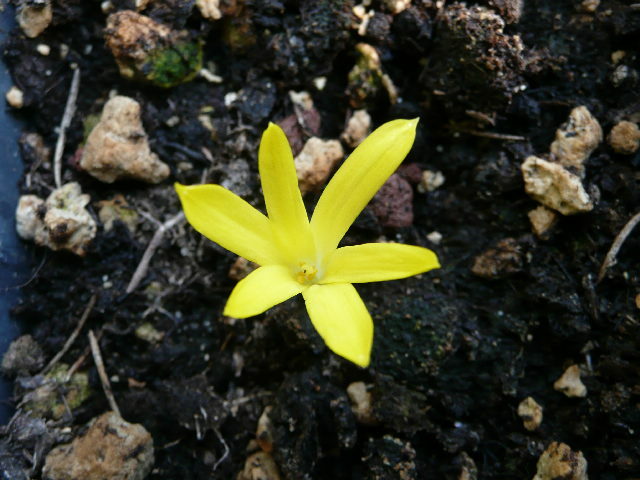 The first photo shows a very floriferous form with flowers of normal size that sprout in mass without leaves. 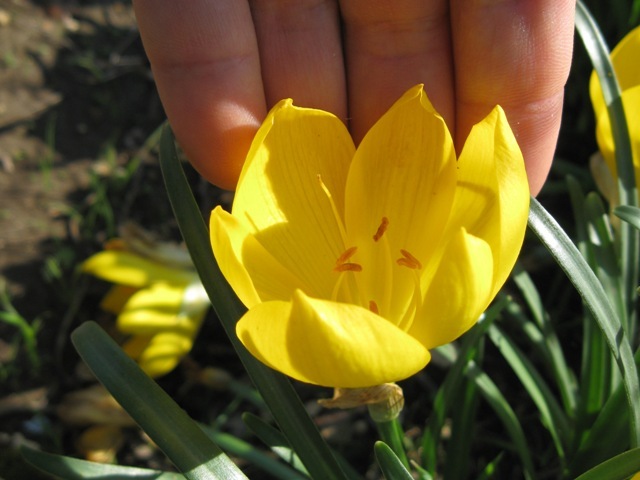 The second and third photos show a form with very large flowers with a nice cup shape. 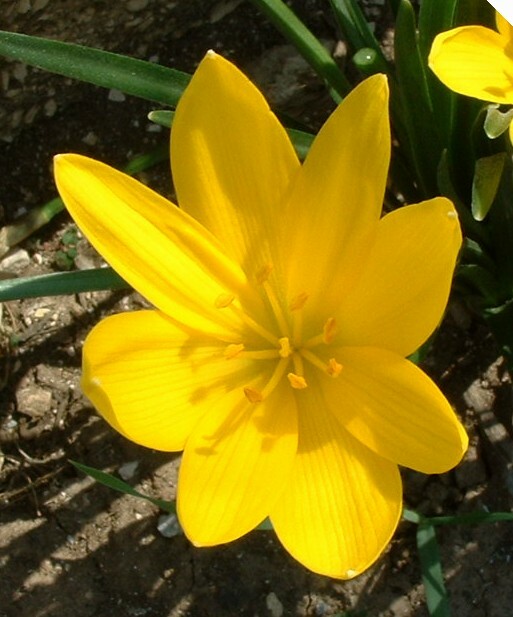 The fourth photo is another large flower form but with straight tepals. 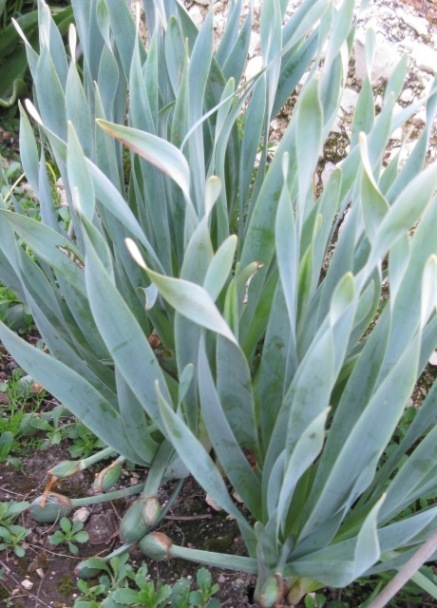 The fifth photo is 'angustifolia'. Photos show my hand for comparison. Photos and text by Angelo Porcelli. 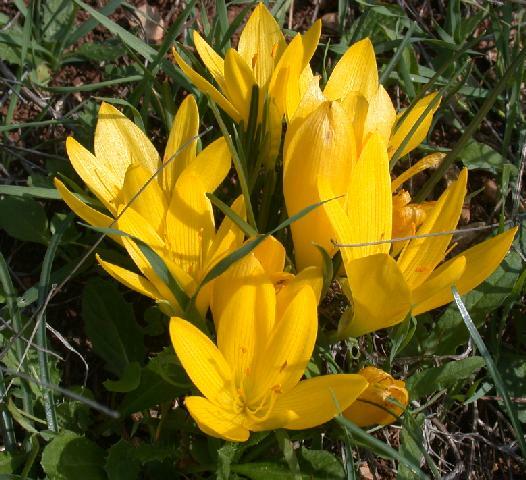 Sternbergia schubertii Schenk is an extremely rare species known only from one location in the area of Izmir in West Turkey. 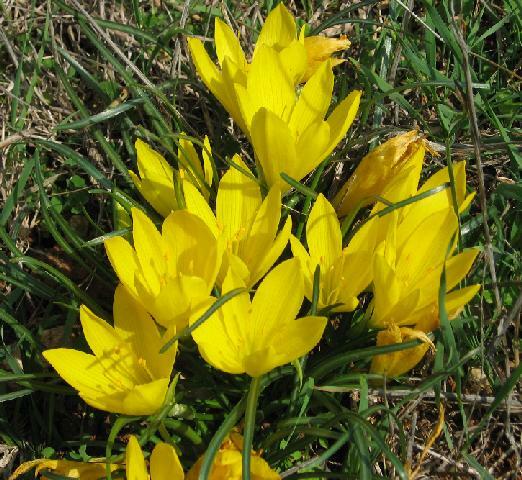 The almost sessile flowers appear in October, leaves not present or just emerging at flowering time. 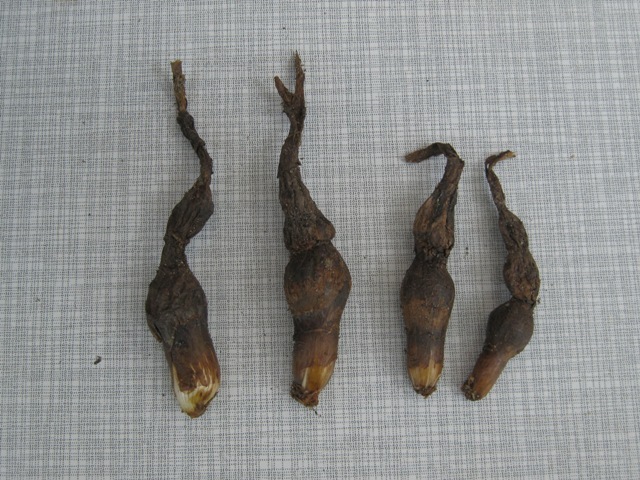 Seed pods appear soon after to mature in a matter of weeks, in the same way Sternbergia colchiciflora does. It is stoloniferous. 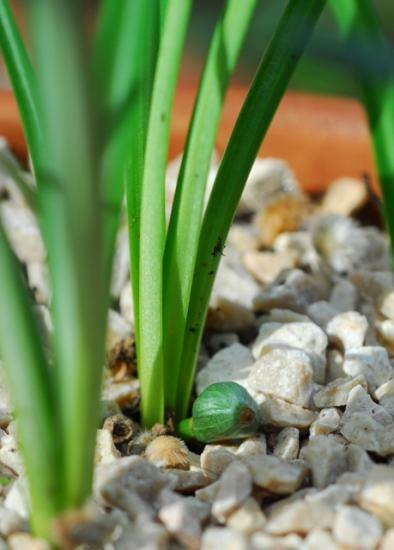 Photos taken by Oron Peri of plants in his collection. 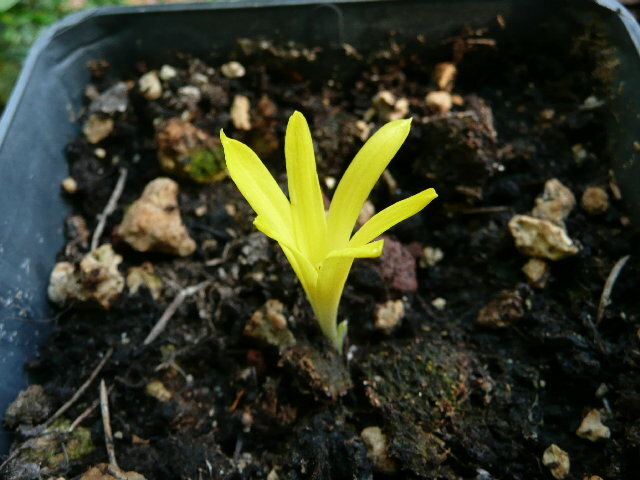 Sternbergia sicula is like a small version of Sternbergia lutea. 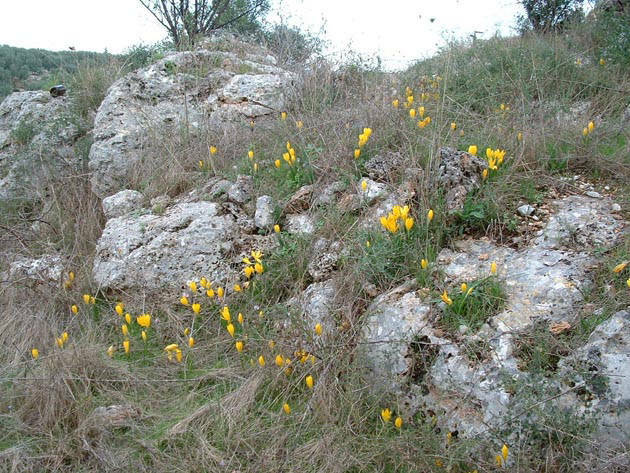 It grows wild on limestone hills in Mediterranean regions. 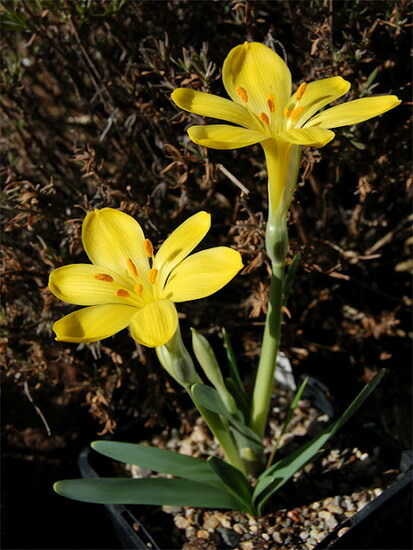 Plants considered to be S. sicula rather than S. lutea are said to grow in more sharply drained habitats than S. lutea, to have narrower leaves, and to be slightly lighter in flower color; however, the distinction between the two entities, both of which grow in this area, is not entirely clear-cut, and some botanists combine them. 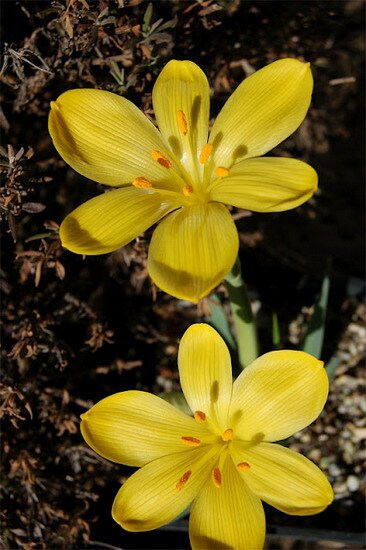 The Kew monocot checklist lists the name Sternbergia lutea ssp. 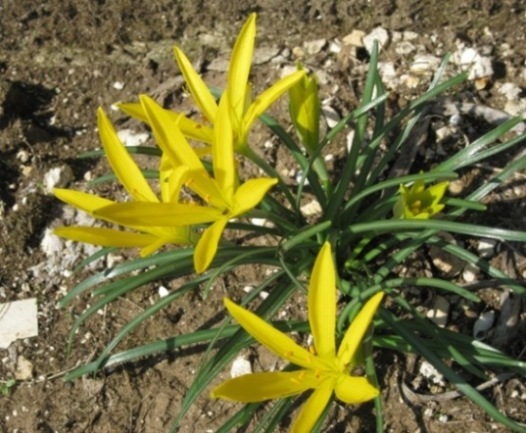 sicula as the accepted name. 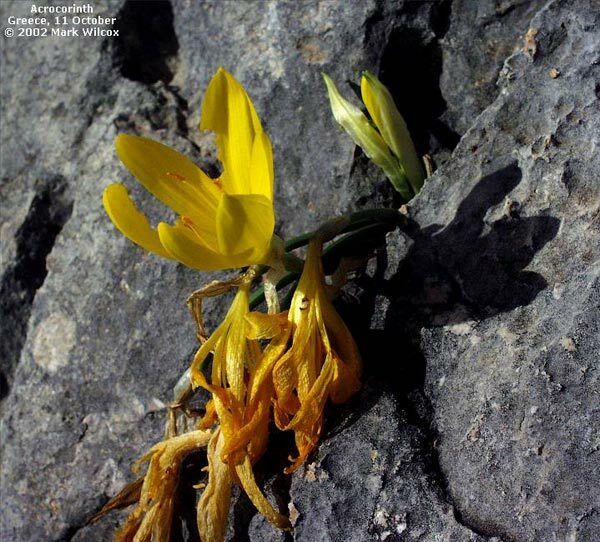 The first two photos by Mark Wilcox were taken at the top of the mountain above Acrocorinth in the Peloponnese region of Greece. 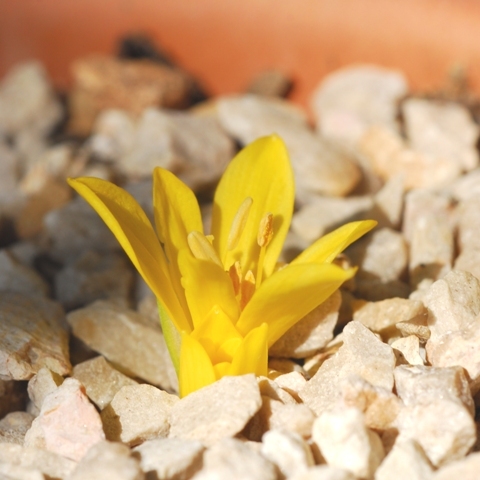 The first picture shows a plant that has somehow grown inside a small opening in solid rock. 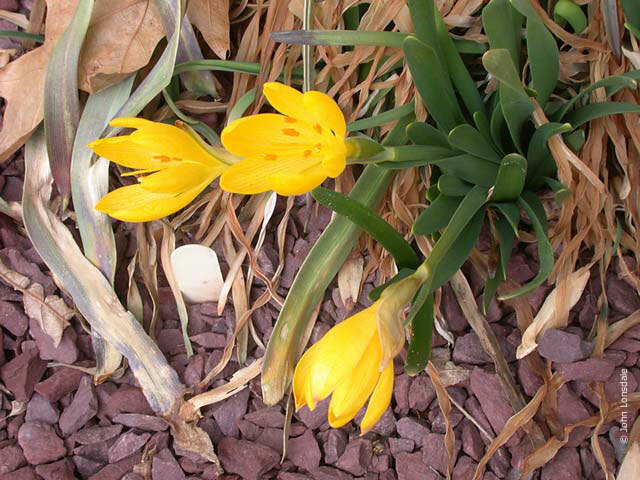 Flowers are shown in bud, bloom, and withered states. 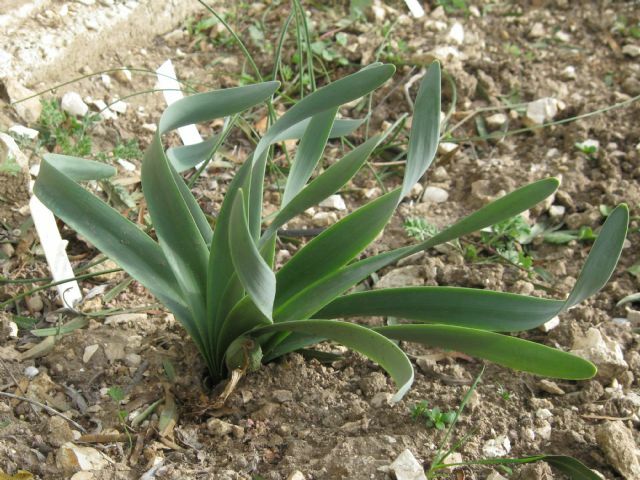 The second photo was taken a few feet away, showing another blooming plant with leaves, more typically sited in soil. They had a southern exposure. The third photo by Jane McGary was taken in the Mani Peninsula, Greece, late October. Photo 4 of seed by David Pilling. The first four photos below were taken by John Lonsdale. 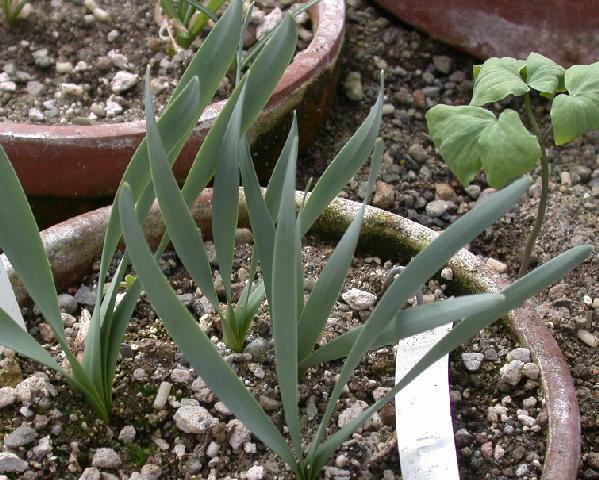 The last two photos, one from John Lonsdale and the second from Angelo Porcelli, show bulbs that are descendants of seed from Rannveig Wallis in Wales collected as Sternbergia sicula ex Crete. 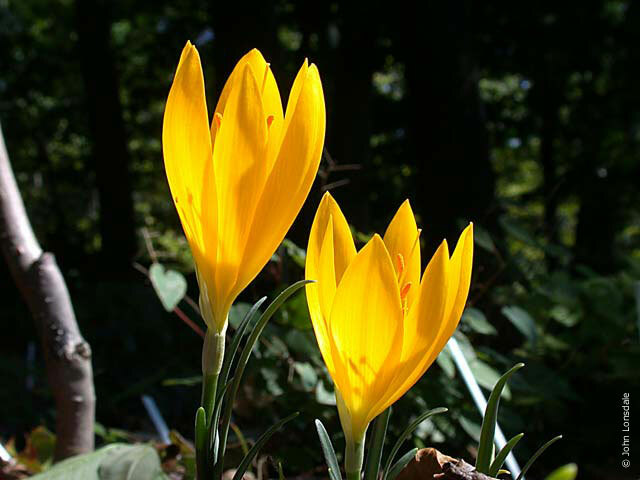 Sternbergia vernalis (Mill.) 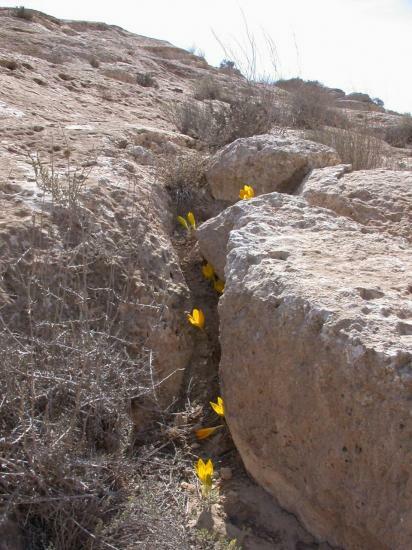 Gorer & J.H.Harvey is a yellow flowering spring blooming species that occurs in stony places in Turkey, Iran, and Iraq. 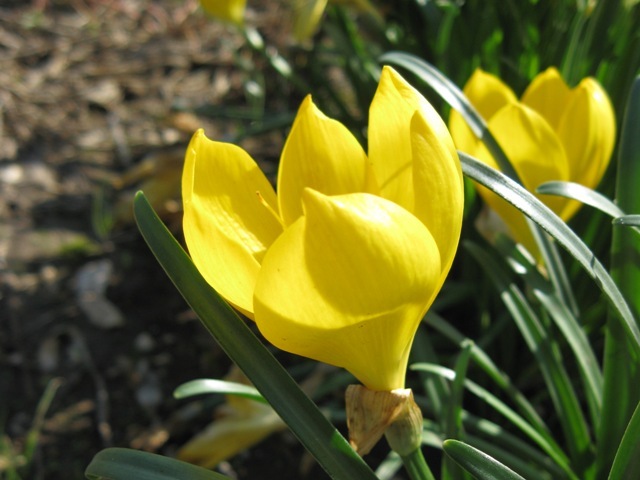 It may be better known in trade and horticulture by the name of Sternbergia fischeriana, which has been reduced to synonym of this species. 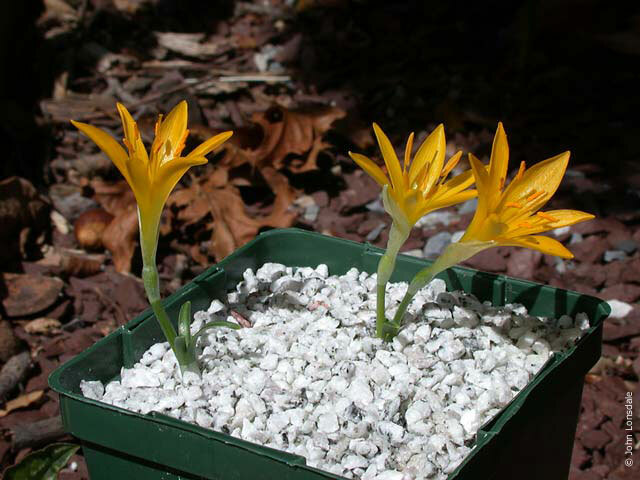 It needs deep-planting and a warm dry summer rest to flower well. First two photos by John Lonsdale. 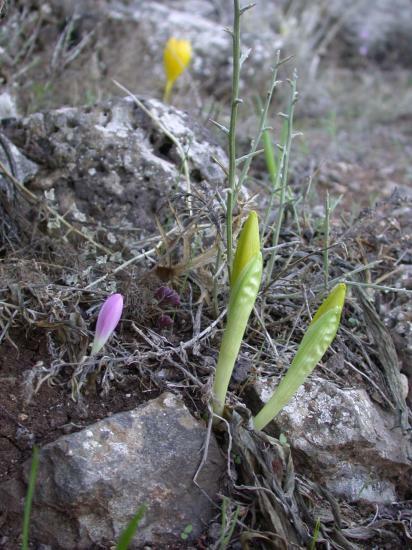 The third and fourth photos by Angelo Porcelli shows the glaucous twisted leaves with the seed pods ripening and a clump with over 20 flowers, in early January 2012. The next two photos are from Hans Joschko. 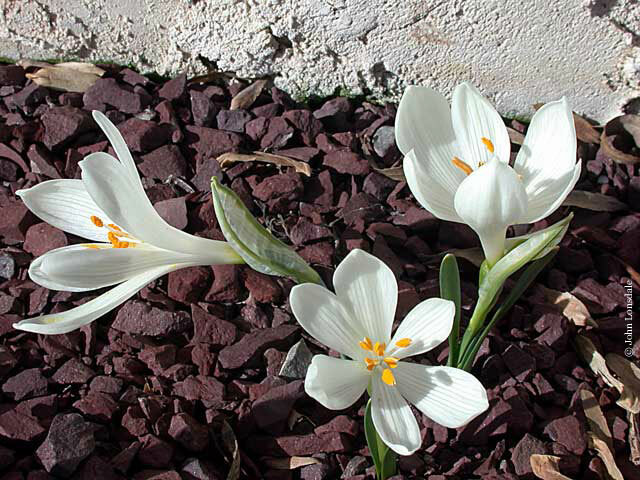 The last photo from Jane McGary shows two plants flowering in January in Portland, Oregon, earlier than expected.